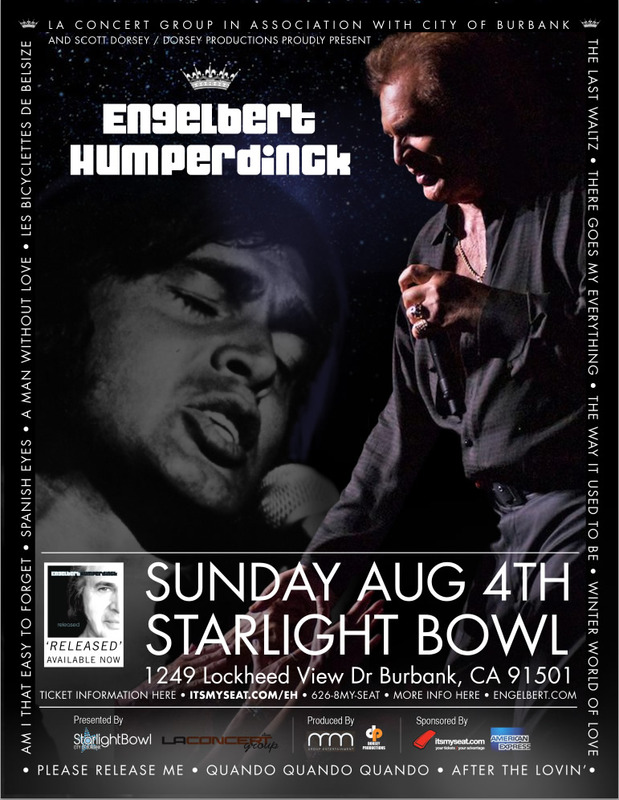 (BURBANK, CA — May 1) — On August 4th, 2013 Engelbert Humperdinck is returning to Los Angeles to perform at the Starlight Bowl–LA’s secret intimate and rustic setting. The evening’s program will consist of Humperdinck’s greatest hits and fan favorites. Attendees are welcome to bring their own picnic and enjoy the concert under a night sky full of stars. stadium-style seating. Both seating options provide uninterrupted views of the stage and allow guests to bring their own picnic and wine. Guests can also purchase food on site; food concessions will be provided by BJ’s Restaurant. The Starlight Bowl is a superb arena to feature an incredible talent, such as Engelbert Humperdinck on stage and under a star studded sky. Engelbert Humperdinck’s extraordinary voice has endeared him to millions of fans around the world. From long-time fans to the MTV generation, Humperdinck’s remarkable talents have stood the test of time. Resonating with contemporary musicians and producers, such as Grammy award winning producer Martin Terefe–who has worked with Train, Jason Mraz, James Morrison and Beverly Knight. Engelbert has just started recording a brand new CD which will feature all-star duet recordings including Sir Elton John, Charles Aznavour, Willie Nelson, Seal, Smokey Robinson, and Lulu. Humperdinck is the first major act to perform on the Starlight Bowl stage since the Amphitheatre re-opened in 1993. We welcome the community at large to join us in this significant evening of music. In person at Burbank Park & Recreation Community Services Building Third floor 275 E Olive Ave Burbank, CA starting on June 4th, and also at Beyond the Stars Palace Theater in Glendale 417 N Brand Blvd, Glendale CA. To stay current with updates and news about the Starlight Bowl, subscribe to their newsletter or “like” them on Facebook. Visit their website and check out their blog for more information. This event is presented by LA Concert Group in collaboration with City of Burbank. This event is produced by M&M Group Entertainment, and Dorsey Productions. For further information email contact@laconcertgroup.com or visit www.itsmyseat.com/EH or call 626.869.7328.